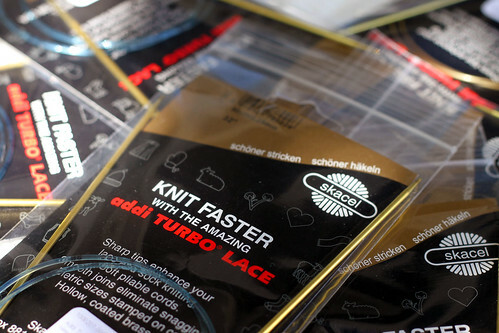 On Friday I ordered several pairs of circular addi turbo lace needles from Paradise Fibers in Washington state. I think it was after 3PM on Friday in fact. They came in Monday’s mail. The shipping option I chose was for 4-7 days. I am amazed. I would definitely recommend them for quick service and the price was less than at my LYS which didn’t have the sizes I needed. I want to try the different sizes on the different sock yarns. It doesn’t seem that one needle size works for all my sock yarn. In the photo below something fun happened. On the right side the letters are all red on the package, but gold outlined in red on the photo. I couldn’t have figured out how to do that if I had wanted to. The pattern doesn’t show really well in the photo below. This is the pattern I hope will work on a pair of olive colored socks. It is leaves alternating with buds on a vine. 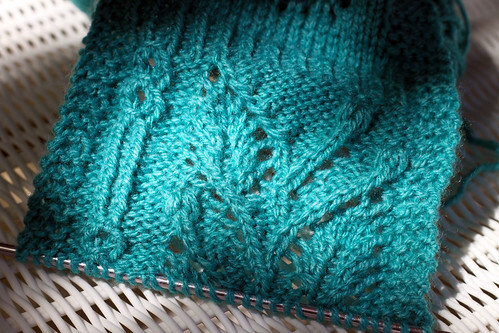 Instead of just repeating the vine around the sock, I am going to put the twisted stitch pattern in between 3 repeats. So the vine will go up the front of the foot and leg and the twisted stitch will go up the back. I think I will even be able to decrease down at the ankle in the garter stitch part for a better fitting foot. I am still deciding if it would work to put another bud or two up into the ribbing. I really like making the buds. This entry was posted on Tuesday, June 23rd, 2009 at 3:00 am and is filed under Knitting. Tagged: Knitting. You can feed this entry. You can leave a response, or trackback from your own site. Gorgeous! Can’t wait to see the finished sock! I *love* Paradise Fibers and agree wholeheartedly that it provides great customer service.